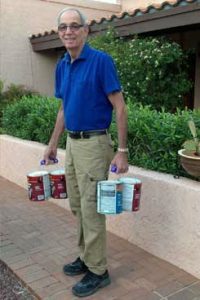 As a busy condo owner living in a big U.S. city, I am always looking for ways to make my life both healthier and easier. I work nights and weekends, so there is little time for food prep and clean up. I’ve collected a few helpful kitchen secrets help shop, prep, create and clean up after a yummy meal or snack. This amazing little strainer attaches directly onto any pot or pan to drain liquid. Instead of wearing pads on both hands over the sink to spill the contents of the pot to a strainer, you can now do this in one quick motion & with just one single hand. The Snap ‘n Strain is made from durable BPA-free silicone. This product is made by an Italian company called I Genietti, which translates into “The Geniuses” in Italian. The tool cuts watermelon neatly & evenly in one motion. It’s a stainless steel tool that is like a knife with tongs so you can cut, lift and serve a slice of watermelon! This is done without getting your hands dirty and without having to cut through the tough rind. This is a nifty little single handed serving utensil. It’s designed to “snap up” an entire portion of food without putting down your plate. The Snapi works best for scoops of salad and pasta! I love these… have you ever gone to an outdoor concert or to the beach that does not allow glass? Wine2go is the perfect solution for this problem. Wine2go is a collapsible flask/wine bottle that is light, flexible and durable. It’s BPA-free and there is no taste transfer, so your yummy wine tastes just as yummy in the Wine2go flask as in the bottle. It’s also ideal for hiking, picnics and for outdoor festivals. FORMcard is an ingenious kitchen secret, a moldable plastic card that melts in hot water & transforms into a “life hack”. It morphs into a make-shift phone stand, a kitchen tool handle or even a missing kitchen drawer knob/handle. Do you forget to bring your reusable bags to the grocery store? Bag Podz is the answer for you as you shop for your meals. Just clip this little pod onto the side of the cart and shop away. Bag Podz comes in a 5-bag or 10-bag set. These bags are durable and are stored neatly in their own personal pod. 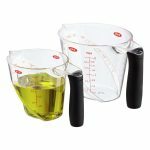 I love these angled measuring cups with OXO’s famous Good Grips handle. The best part is that it’s easy for the cook to convert into both cups and ounces so it makes any recipe easy to follow. The angled gradations are imprinted on the inside of the cup so it’s super easy to read the units of volume from both the top or from the side. Bonus – it’s dishwasher safe! 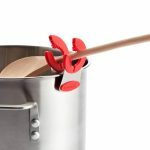 This clip conveniently attaches to the side of your pot or favorite saucepan to hold your utensils. No more dirty spoons on the counter and the “dreaded” drip goes right back into the pot. It’s made with heat-resistant silicon and stainless steel so it’s both sturdy and safe! This is a combo “life hack”. The 3-in-1 slicer halves the avocado, pits the avocado and finally slices the avocado so you can make some home-made guacamole. Next, the Guac-Lock keeps your guacamole fresh! The freshness is locked in by keeping the air out so the guacamole doesn’t brown. This air-tight container stores 12 to 24 ounces, is dishwasher safe and doubles as a serving dish. A must buy! I’m currently trying to drop a few pounds, so I’ve cut out pasta and am replacing it with zucchini strands and spaghetti squash. The Good Grips Hand-Held Spiralizer by OXO helps you create pasta-like noodles. You can also use cucumbers, beets or make curly fries from Potatoes. 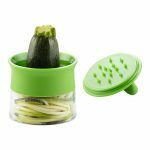 It’s easy to use as there is a non-slip food holder that grips the veggie and makes perfect spirals from the veggies. Plus, the veggies are ALMOST as delicious as the real pasta with much fewer calories. Here’s a great kitchen secret… I can’t live without PalmPeeler. 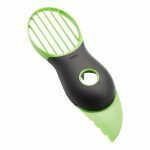 It’s a fruit and vegetable peeler that slides onto the finger, fits ergonomically and comfortably into your palm and peels like a charm! It even has a potato eyer at the tip of the tool. The PalmPeeler makes peeling a breeze! 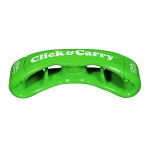 Click & Carry’s magic handle allows shoppers to manage and carry multiple bags at once, either in your hands or over the shoulder for a hands-free carry. The key is to evenly distribute the weight on both ends of the Click & Carry so the handle can balance on the shoulder. 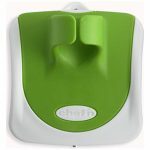 This gadget frees up your hands to hold the baby or open the front door without putting down your groceries. 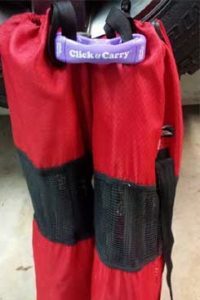 I attach the loose bags to the Click & Carry while it’s in the cart, transfer the bags to the trunk of the car and then when I arrive home, I simply gather the handle, toss it over my shoulder and boom – I’m on my way without having to regather 5 or 6 loose bags. If you’re like me and pressed for time, kitchen secrets like these can make life a little easier. We hope you check them out, and if you have ideas of your own, please share in the comments. Our community would love to hear what you have that saves time and hassle around the kitchen. One of the biggest challenges of being a busy mom is grocery shopping. You’re trying to stock up on everything – so why not find the best solutions for shopping? It’s hard to say what’s worse: your child asking for something on every aisle, or the juggling act of bring in all the groceries when you arrive home. It’s all pretty daunting, right?!? 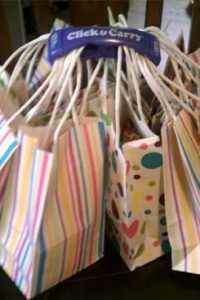 We want to help, so here are 10 quick tips to make that grueling shopping adventure a fun and entertaining mommy & me activity. Have a shopping list or meal plan strategy prepared – A favorite & familiar store makes knocking out the list MUCH easier as you can arrange your list by aisle Choose an app to help you with your list and for meal planning. Park your car close to the cart return to make the transition back home a quick and easy one. Cart handles can be dirty so be proactive by bringing a shopping cart cover – or even sanitary wet wipes with you to clean down the cart, seat and handle prior to putting your child into the kid friendly seat. Make sure your kids are fed or plan “shopping snacks” to avoid a meltdown. Perhaps you can plan a picnic in the car, stop at a favorite sandwich shop or begin the shopping run in the store’s deli to energize your mini-shopper and fill up his tank. It’s dangerous to shop with a hungry kid. Allow her to take items off the shelf, but only with mom’s approval. You may also allow her to play with her baby in the back of the cart, but only if she remains seated. Make a grocery list with the kids – going to the store can be a fun game when the children are prepared to help you locate the items on your grocery list. Check out The Clip Trip, a site to create a “kid friendly” list complete with pictures of the items selected on your your list. They also offer fun puzzles and numerous learning activities to entertain kids on your shopping journey. Give your child “assignments” – they love to feel a sense of accomplishment,so try giving your sweetie a task. For example, he can grab something heavy like a gallon of milk or she may help you to select the “perfect” peach or he may read you the next item on the list. You can even complete the shopping trip by preparing a light bag for her to carry into the house. Be creative – plan some games to keep your child’s attention. Ask “If you could buy 3 of your favorite foods, what would they be?” or “What is a drink that will make your bones grow big and strong?” or “If you can only eat one kind of candy in the whole wide world, which one would you pick?”. Another fun option is bring some toys to occupy her attention (at least part of the time). If your child asks for everything from cereals to candy, how can you keep him happy? Try negotiating a little “delayed gratification”. For example, ask, “Do you want a cupcake as a treat?” If you receive a yes, then say “Well, first let’s pick out some cake mix”, then, ask “Which icing and sprinkles do you want for your yummy cupcakes?”. While in the check out line, be sure to pre-gather your bags. I always connect my bags together with Click & Carry handles while the items are still in the cart. This is a perfect “mom life hack”. I can easily lift the attached bags into my car’s trunk. When I arrive at home, I unbuckle my little one, grab my Click & Carry handles, throw one set of bags over my shoulder, take my little one’s hand and hustle all the groceries into the house in just ONE quick trip. Bonus tip – have your keys ready to open the front door. If all else fails… There is an amazing new program Kroger is testing nationwide. Kroger’s program is called Click-list and it’s a huge time saver! Simply order your groceries on-line, pull up to a valet station at the grocery store and then a store associate comes out to put the purchased items in your trunk. You simply drive home and unpack! Shopping doesn’t have to be dreadful for you and your family. We hope you have gleaned an idea or two (or more!) to use on your next shopping spree. You don’t have to be part mom, part octopus – with a little planning, you can simplify your journey while making it more fun for everyone. Let us know if you have tried these or other ideas and what you find in the comments below. We’d love for everyone to share with our community!